Digital Etiquette means that you should be respectful because everybody that you are talking to because ever body is a real person that has feelings. Your personal information should never me shared online because people can use it to to send you spam. Spam is where people send you emails that could have scams and viruses in them. Social networking is a p;ace were you can talk to people on the internet, if someone that you don' t know so if they want to join your chat don't let them. Online safety is a very important because if you give you information that is not good. You also should keep your password safe like don't to anyone even your best friends. Cyber bulling is when someone sends you something that is very hurtful or mean most of them think that they are just playing a harmless joke but other might take it more serious. To not get cyber bulling be smart online. Plagiarism is when you take someones info that they put on the internet or a book if you plagiarize someones work you could get an F on the assignment and maybe fail the class. Copyrights is when you post like a song that is your song and nobody can take it without your permission. 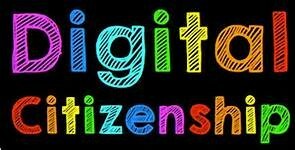 Digital citizenship is 7 rule that are very important because the most important thing to remember is that you need to be respectful. You should also never very give out personal information because people can use that to send you emails that have ads that sometimes can lead to viruses and some of them have have things that kid can not see.